How we approach death and the dying, how or whether we remember or care for the dead – these questions are inextricably bound up with how we age, or don’t, in the dominant culture of the West – and with the disappearance of elderhood as a skilled function in these times. 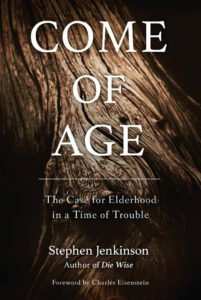 I have three cartons of Stephen Jenkinson’s new book in my office pending his appearance in Portland this Fall – but you don’t have to wait. The book is available through your local independent bookseller or the Orphan Wisdom School.